Problem is the skins aren't working... They show up in the skin browser if I force the skin property into existence, but they don't show in the model browser (there's no little plus sign next to the model) and when I choose a skin from the skin browser it gets put on the painting in DR but then still doesn't show up in-game. All I did was I created a .skin file with a few of them, but from reading the wiki I couldn't figure out what else needs to be done. Looking good. Are you sure you put the .skin file inside a skins folder, and that you have directed DR to your project's location? Also, check spelling and the paths inside the text file, thats often the cause of problems. Edited by RPGista, 04 October 2018 - 01:33 PM. It's inside the general skins folder. 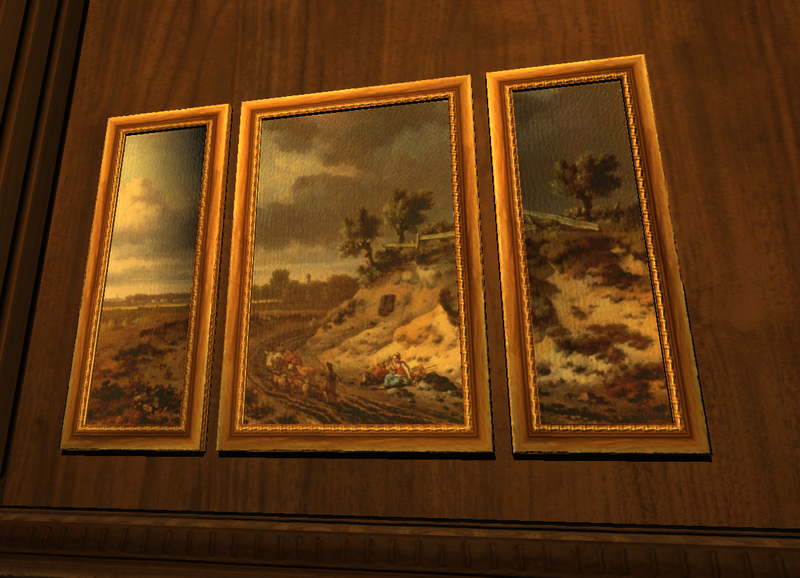 Like I said, they show up in the skins browser, and in the painting itself but only in DR, not in-game. So that means DR is finding the file, at least, and that what I put in there works, at least that much. Edited by Skaruts, 04 October 2018 - 01:39 PM. Try setting the full paths of the materials. Edited by R Soul, 04 October 2018 - 01:46 PM. That seems to not work. Isn't there something that has to be done with the material? Edited by Skaruts, 04 October 2018 - 02:21 PM. If that path is correct it should be working. This reminds me we definitely need more Builder-centric religious art. Ah wait, it's working. I was checking if the skins were listed by going to "choose model" on the already existing triptych. Skins don't get listed in that one for other models either. They do get listed when I create a new model, and so it's working as intended. I think I need to change the UVs though. I made them thinner to accommodate for the thinner frame, but it looks cut off on some skins. I was afraid it might look a bit squeezed if I didn't do that. Will see how it goes. How do I make it so it doesn't override the default file? Edited by Skaruts, 05 October 2018 - 12:46 AM. the name after "skin" in the line outside the bracketts is what your skin will be called. So, you should use a unique name here to prevent any intererence with other skins. Inside the bracketts you first need to define models, for which this skin will be availabel. Thus, if you want to have the skin for various models, you can simply list them under each other (always in the the style "model [modelpath]"). Beneath that you define which textures should be replaced by which other textures (in the style "[old texture] [new texture]"). Again, you can replace several textrues at once, by simply listing them beneath each other. One problem may be that the textrue you want to replace has to have the same name on each of the models or it has to be listed seperately for each unique texture name (e.g. in your case: if it is called painting02_L only for this model, but painting02_S in another, it will be replaced only for your first model). I hope, I did not just tell you things you already knew, but with this knowledge it should be no problem to create skins for several models and not interfere with any existing ones. So the basic structure is skin (new skin name); model (path to your model); (current material) (new material). Thanks guys, it seems to be working properly now. As an added bonus it also seems like I don't need to restart the game anymore when I change the skin in DR. 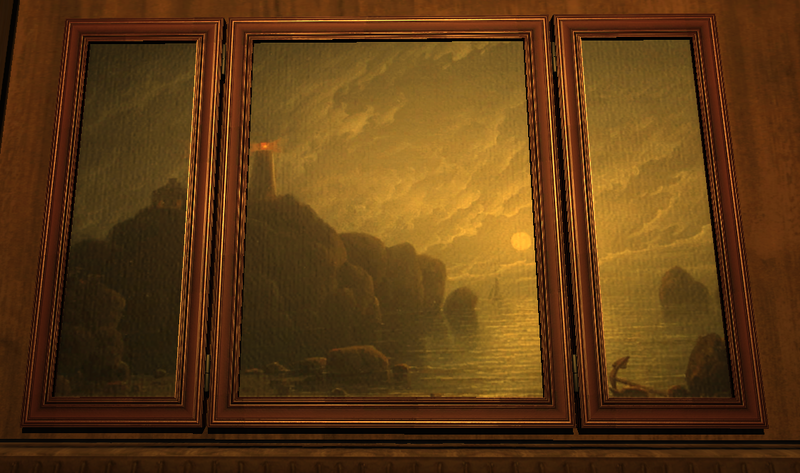 This looks quite nice with some paintings, I think. Not so nice with some others. I might make a new model for these. This looks really cool! 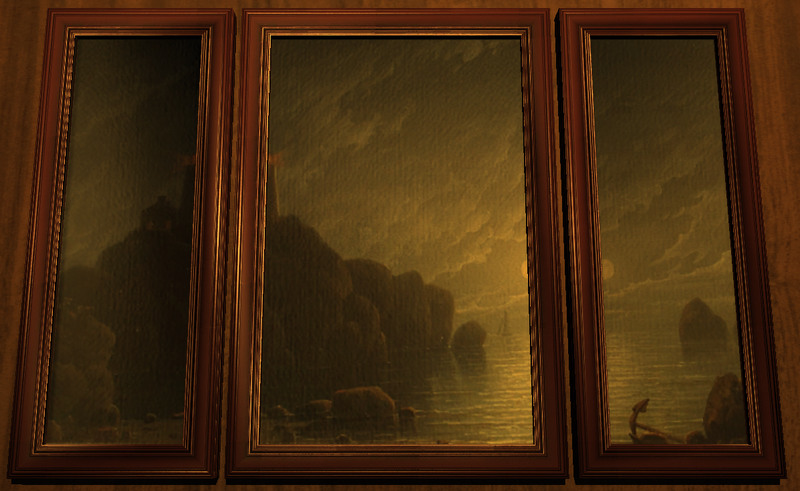 One bit of feedback though, the split lighthouse and the split moon on the bottom picture looks strange to me. Maybe not all paintings are suitable for this format? Is there any reason why some skins in the default file don't have the "skin" keyword? I think the game infers from the .skin extension that it's a skin if the keyword is absent. In Doom3+RoE you can find e.g. entityDefs and skins for the X-ray machine zombies placed together in monster_zombie_xrays.def, but TDM organisation favours putting all skins in skins/*.skin. I'm working on one that can be folded. Had to widen the center piece and narrow the sides to make them fold properly, and so this one accommodates to some of the paintings that don't go so well with the other triptych. 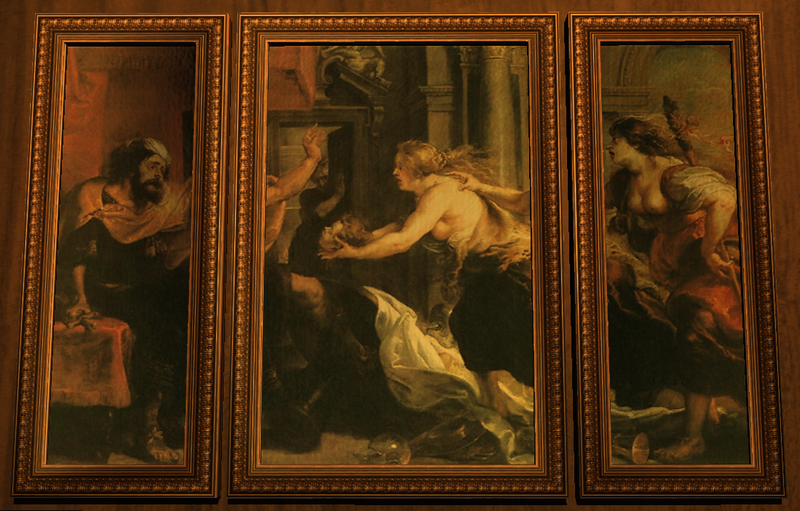 For skins we could start with some actual triptych artworks out there. It's a good model, so it'd be great to have artwork that lets it shine. Would you take a stab at rewriting it, Judy ? I'd be for it. 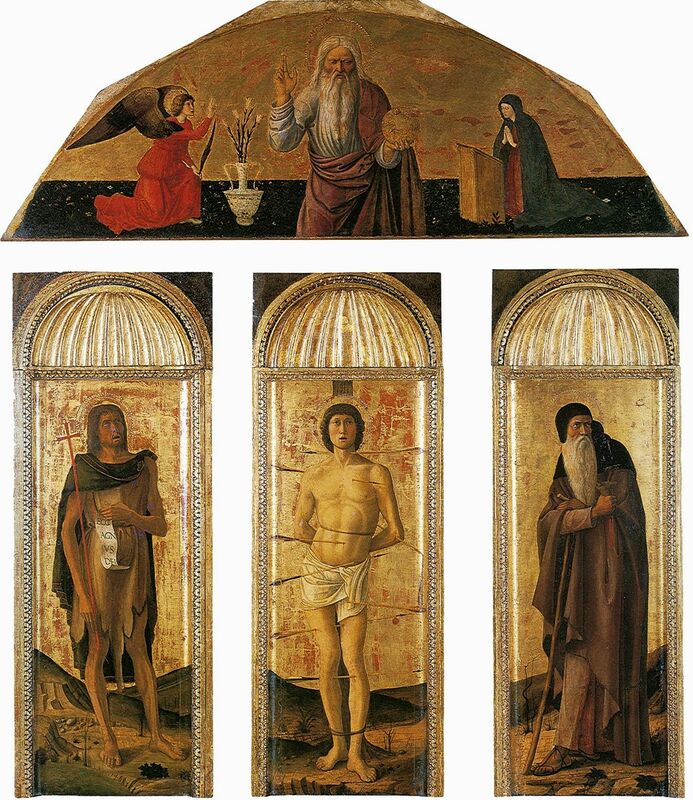 Should I rummage through some images of historical triptychs from the Late Gothic art of Spiš ? Edited by Petike the Taffer, 05 October 2018 - 10:47 PM. I'm also not exactly sure what to look for, in terms of what's adequate for TDM. I'm also not too acquainted with antique art. 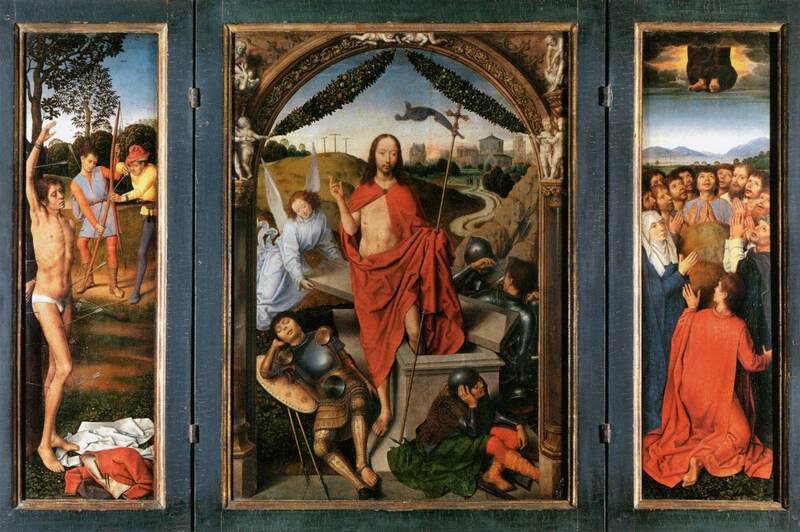 But yeah, quickly flipping through the Met collection, all the European triptychs seem pretty Christ-oriented. 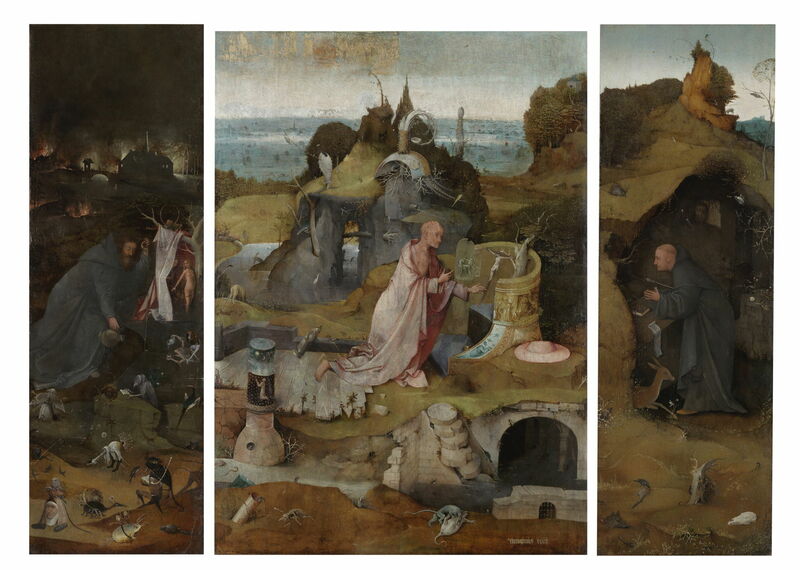 Our triptychs should be religious too. My thinking was that you could adapt Christianity oriented ones to Builder oriented ones. Somebody can put some thought into it and adapt Christian figures to Builder figures and figure out a few characteristics you can consistently change, like the face, colors, clothing style, a pillar instead of a cross. I mean, what are the central figures and stories of the Builder religion anyway? I was thinking about something like that. Just an idea though. I think for the purpose of these models, at the moment I'm gonna focus on finishing them with the existing paintings in mind, even if they weren't made for triptychs (Execution fits the non-foldable model quite nicely). Maybe later on I tackle something different. Or if someone wants to tackle it, go ahead. I'm planning on handing out the models for TDM if you're interested or for anyone who wants to create paintings that fit them or use them in missions. If I felt confident about my painting skills I might even try making some originals, actually. Well, I've pretty much finished the models, I think -- skaruts_triptychs.txt 107.83KB 1 downloads -- rename extension to .rar. Due to the nature of how the painting textures get split up between the parts of the models, some of them don't look right, and so not all paintings are available as skins, and some are available in one and not the other. You can still perhaps force a skin by bringing it from a normal painting, but I've not tested that. This is currently only a decorative piece. I've no clue how to turn it into a loot painting, although I suppose it has to be made into an entity, and perhaps that's something that's out of my reach. Poly count on the foldable version ended up being much higher than I initially expected (2820 tris). The hinges took the bulk of it (and I needed some extra geometry to work around bad smoothing, which ase format didn't seem to resolve). I wouldn't call it a trivial model, so perhaps it should be used sparingly. I don't know if there's an established procedure for making models available, so if there's one please let me know. Edited by Skaruts, 09 October 2018 - 10:15 AM. How many polys are the hinges? Given how small and obscured they are, they shouldn't really need to be very detailed.